To mark National Empty Homes Week, KCC announces up to 650 empties will be returned to use in current financial year No Use Empty, the initiative to return empty properties to use led by Kent County Council, marks National Empty Homes Week by announcing that it is on course to create 650 new homes in 2014 – 2015, a new record. The scheme, run in partnership with twelve local authorities across the county, is widely regarded as the UK’s most successful empty homes initiative, returning 611 empty homes to use in 2013 – 2014, and 512 in 2012 – 2013. Launched in 2005, No Use Empty has returned over 3,500 empty homes to date, reducing the total number of empty homes in Kent to around 5,840. The initiative was the first in the UK to offer financial assistance to owners willing to refurbish properties empty for over 6 months, and return them to use. The No Use Empty Loan Find administered by KCC, offers up to £25,000 in interest-free funding per housing unit created, to a maximum of £175,000. The loans, repayable in three-years and recycled back into the Fund, total £11.7M to date. Earlier this year, No Use Empty launched a spin-off Affordable Homes initiative , in partnership with social housing provider AmicusHorizon. Under the new initiative, loans of up to £250k per project are available, on the basis that units are available for affordable rent, at 80% market value. Under the terms of the Loan AmicusHorizon manage the properties and guarantee the rental income for a period of five years, meaning that large scale projects delivering a number of units are more financially viable for individuals and small developers. NUE is on course to meet its target of 45 affordable units by the end of the financial year, unlocking £795,000 of funding from the Homes and Communities Agency. National Empty Homes Week is organised by charity Empty Homes and runs from 1 to 5 December 2014. “The charity Empty Homes who have been extremely supportive of No Use Empty, and we in turn are huge advocates of Empty Homes Week, and the work it does to encourage action on long-term empty properties. HAVE YOU SIGNED UP YET? – WE HAVE! The Empty Homes Agency (EHA) are asking local authorities to sign up to support the Empty Homes Agency campaign to reduce long-term empty homes (empty for six months or more) across England. Have an empty homes plan or strategy for your area, with aspirations to reduce the number of long-term empty homes. Seek to attract and/or allocate resources in your area to refurbish empty homes or empty spaces above shops for those in housing need. Working in partnership with property owners, housing associations and community organisations to do so. To show your support, simply email: policy@emptyhomes.com, with the message: “we are a local authority supporter of the Empty Homes Agency campaign to reduce the number of long-term empty homes across England”, and the subject line: “Local authority supporter of the campaign to reduce the number of long-term empty homes”. It would be great if you could email us soon, and by the end of December 2014 at the latest. As part of the EHA campaign, we will be asking all the Westminster political parties to pledge that, should they form the next government, they will adopt a plan to tackle empty homes within their first year in power, as part of a wider approach to tackling housing need. We believe priority should be given to this work, as bringing empty homes back into use plays an important role in meeting housing needs. 42 loans awarded, allowing works to start on 146 units. NUE providing £2.7m financial support levering in £5.9m from publlc/private sectors. During the year 611 empty properties were brought back into use across the County through all interventions. We have already undertaken a number of proejcts to convert former commercial premises to residential use, maximised empty spaces above shops and have developed a new partnership with AmicusHorizon in relation to our Affordable Homes Project. Please spend some time looking at our website especially videos and case studies sections to see for yourself the results. NUE, the empty homes scheme run by KCC has started development on a long-term empty building in Folkestone that was once the home to Army Intelligence during the First World War, responsible for saving hundreds if not thousands of lives. The locations, 8 and 9 Marine Parade, in Shepway Borough Council, were transformed into the centre of army intelligence under the command of Major Cecil Alymer Cameron, code name ‘Evelyn’ but eventually fell into disrepair. However, the NUE scheme, which provides funding to bring long-term empty homes back into use, is working with Lt. Col. Martin Neame to convert the two buildings into 12 flats. The buildings at 8 and 9 Marine Parade housed a spy school that trained celebrated spies such as Léon Trulin and Louise de Bettignies, code name ‘Alice Dubois’, who both instrumental in passing intelligence to the British Army. 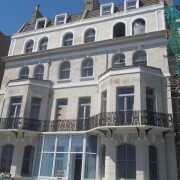 In order to bring this historic building back into use NUE has issued an initial loan of £149,999, for the conversion of 8 Marine Parade. After completion, which will create 6 flats, the loan will be repaid to NUE and then reissued in order to deliver a further 6 flats to 9 Marine Parade. Marine Pararde also featured in the BBC World War I Programme ‘The Spies Who Loved Folkestone’ (Episode 8 of 11) which also includes an interview with the new owner (10 mins 22 secs in). Recently Appointed Chief Executive Empty Homes Agency visits Kent’s No Use Empty Initiative. 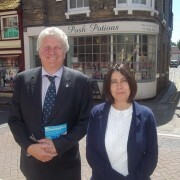 The NUE team were pleased to welcome Helen WIlliams to Kent on 2nd July 2014, during which time she met with KCC Cabinet Member, Mark Dance and was taken to see a variety of projects in Maidstone, Hythe, Folkestone and Dover which are currently being supported with interest free Capital Loans. “On becoming chief executive of the campaigning charity Empty Homes at the end of April, I was advised to visit Kent to see what has been achieved by the No Use Empty initiative. Two things stand out for me about why it has been successful, firstly it is very much a partnership between Kent County Council and twelve district councils and secondly the scheme has been prepared to support owners to refurbish a variety of properties, ranging from former hotels to individual houses and disused spaces above the high street. In my job I am privileged to see many examples of how councils up and down the country are working hard to ensure empty properties are brought back into use to meet local housing needs and I am keen to see approaches such as No Use Empty Initiate spread”. A record £1 million was invested in returning empty homes to use in Dover in 2013 – 14, according to new figures released by No Use Empty, the county-wide empty homes scheme run by Kent County Council. 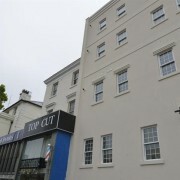 Dover District Council, a founding partner when Kent County Council launched No Use Empty in 2005, issued interest-free loans totalling £1.05 million to owners of empty properties in the last financial year to fund the necessary repairs to return them to use. A total of 54 properties were supported in the district as a result, over three times the number achieved the previous year. Projects completed over the past year include the conversion of The Marina, a former care home on Deal seafront, into 11 new homes. The £400,000 project, the largest ever undertaken in Dover, completed in the Summer 2013, prior to which the building had been empty for over five years. 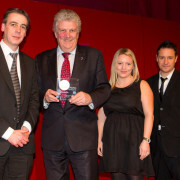 Kent County Council’s ‘No Use Empty’ initiative was among the winners at the inaugural Placemaking Awards at the British Museum in Central London. The scheme, which returns empty homes across the county to use, won in the ‘Partnership’ category, in recognition of the collaboration between all twelve authorities in Kent, national charity Empty Homes, Homes and Communities Agency and the social housing provider Amicus Horizon. City Council and authorities across the West of England launching their own ‘No Use Empty’ initiatives. The scheme has also been used as a template by the Welsh Assembly and Scottish Parliament, both of which have launched national initiatives to tackle empty homes. The judges praised the scheme’s ‘innovative approach’ and ‘outstanding results’ with 3,130 former empty homes in Kent now returned to use and occupied. The awards received almost 300 submissions from the public and private sector, across 16 categories. Mark Dance, Cabinet Member for Economic Development, KCC said: “We are incredibly proud of the No Use Empty scheme, and it is a credit to all involved that it has been recognised on a national level at the Placemaking Awards. which is underway on Sandgate Road in Folkestone.